SHANGHAI (Reuters) - As Beijing and Washington veer towards a full-blown trade war, American brands in China face what may be an even bigger threat: local rivals armed with innovative products and the Chinese government's blessing. American household names like Apple (NasdaqGS:AAPL - News), Starbucks (NasdaqGS:SBUX - News) and Procter & Gamble's (NYSE:PG - News) Pampers are seeing their dominance challenged, a potential threat to the hundreds of billions of dollars U.S. firms make in China. According to an analysis of data from Bain and Kantar, local brands snatched almost three-quarters of China's 639 billion yuan ($97 billion) market for fast-moving consumer goods - a category that includes items like soft drinks and shampoo - last year, up from two-thirds in 2013. The data, shared with Reuters, shows that U.S. products like Pampers, Colgate (NYSE:CL - News) toothpaste and Mead Johnson infant formula saw their market share drop around 10 percentage points in the past five years. The data was based on a survey of 40,000 urban households. At the same time, savvy Chinese brands like SeeYoung, offering a popular silicon-free shampoo, and Pechoin, a maker of skincare products that plays up local ingredients, gained rapidly. "Local competition is now extremely high on the agenda of foreign firms in China," said Bruno Lannes, Shanghai-based partner with Bain & Co, the consultancy that co-authored the report. "In order to win in China now they need to beat not just traditional competitors," he said. "But they need to win against local companies that are faster and more innovative than they had realized." American brands have long enjoyed a vaunted status in China. U.S. fast food, beverages and coffee chains are ubiquitous in China's cities, while consumers lap up U.S.-branded infant formula, designer jeans, cars and smartphones. That dominance, however, is threatened by China's push to bolster domestic brands by creating champions in certain categories and weeding out weaker players to improve quality. Brewing trade tensions could exacerbate this slippage, threatening more than $180 billion in sales by U.S. firms in China last year, according to an analysis of 121 U.S.-listed American firms that broke out data for China sales in the most recent fiscal year. The total is likely far higher as many U.S. firms with a major China presence - including Starbucks, McDonald's (NYSE:MCD - News) and Walmart (NYSE:WMT - News) - don't break out China sales. Apple made $44.8 billion in China in the last fiscal year, P&G around $5.2 billion and the sports apparel maker Nike (NYSE:NKE - News) $4.2 billion. A trade war now looks more likely after talks in Beijing and Washington failed to defuse grating issues between the two countries over a trade imbalance, technology transfers and barriers that firms face doing business in China. But the bigger threat might be the advances made by Chinese rivals. Apple's iconic iPhone has seen its share of the country's smartphone market stall at around 10 percent since 2012, according to data from the analytics firm Canalys, and has been overtaken by upstart domestic phone makers like Oppo, Vivo and the more established Huawei [HWT.UL]. Starbucks, which boomed in China on the back of a budding coffee culture, said its same store sales growth in the country slowed to zero in the second quarter of 2018. The firm cited delivery issues, but it has also been facing a rising tide of small, fast-growing domestic rivals in China's big cities. It's not only U.S. brands that are feeling the squeeze. A European trade body recently cited "stiffer competition" from Chinese rivals as one of the main anxieties felt by European brands. And some firms have bucked the trend. The biscuit brand Oreo remains strong in the market, while Coca-Cola (NYSE:KO - News) and Pepsi (NasdaqGS:PEP - News) recovered last year after losing ground between 2012 and 2016 to juice and water drinks seen as more healthy. Overall, local brands gained market share over international rivals last year in 21 product consumer product categories like skin care, shampoo and infant formula, according to the Bain report. Local brands grew 7.7 percent last year versus tepid 0.4 percent growth for overseas rivals. "That's definitely a trend," said a senior executive at a major U.S. consumer goods firm, adding that the biggest challenge his firm faced in China was strong domestic rivals. Chinese brands are getting increasingly confident about taking on overseas brands, including in high-tech sectors. In China's auto market, the world's largest, domestic car brands - helped by supportive policies - have sneaked up on foreign brands over the past five years, challenging Ford Motor Co (NYSE:F - News), General Motors Co (NYSE:GM - News), and the electric carmaker Tesla Inc (NasdaqGS:TSLA - News). The government's promotion of electric vehicles as a key industry has lured dozens of new Chinese competitors to enter the market. Ian Zhu, a partner at NIO Capital, the investment affiliate of NIO, a Chinese electric vehicle start-up, said a shift to smart, electric and autonomous cars would bolster local brands as the vehicles increasingly become entertainment and work spaces rather than just a means of transport. "You have to know local tastes and the local environment really well," he said. "Foreign companies will have tremendous challenges in that." China's "Made in China 2025" push, which includes strategic areas including new energy and smart vehicles, is also helping local brands. In other high-tech areas like medical devices, semiconductors and pharmaceuticals, China is pushing its own domestic champions to trim reliance on overseas markets. Many firms have responded by shifting production to China, which can give a brand quasi-local status. 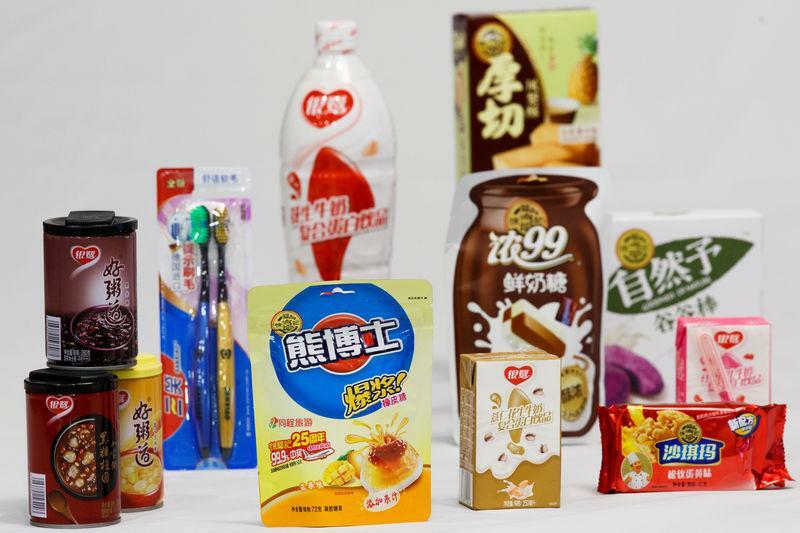 "Most of what we sell is domestically produced," Ze Dias, China managing director for Kraft Heinz, told Reuters at the recent Shanghai launch of the firm's Jif Jaf biscuit, a China-only Oreo look-a-like with flavors including chocolate cheese and spicy chili. Dias said the firm was exposed to some fluctuations in the commodities market related to trade tensions. Longer-term, however, he hoped the United States and China would resolve their issues. "There are short-term bumps in the road," he said, but the United States and China "will cooperate more than compete".